The first thing that popped into my mind as the Tigerair plane I was boarding skidded into the tarmac of Iloilo International Airport was batchoy; that sinful noodle concoction native to the City of Love. The slightly sweet salty taste of its soup I once tasted right at this very airport triggered my mouth to salivate; making me forget about the pain in my ear, usually brought upon by riding airplanes. Less than an hour later and we were passing through the darkened maze of La Paz Public Market, the place where batchoy originated from. That dish isn’t actually called La Paz Batchoy for nothing. But we were not looking for just any batchoy, we were looking for a particular eatery claiming to be one of the original makers of that distinctive Iloilo noodle soup, Netong’s Original Special Batchoy. It didn’t take long before we found our query. Netong’s Batchoy is something of a legend among these parts. A few directions through pointed fingers and lips and we were at the old-school eatery. We didn’t actually even have to mention Netong’s name, we just said batchoy and everyone knows where we wanted to go. Miki, a type of egg noodle almost similar to spaghetti albeit finer, piled on plates greeted us as we entered Netong’s batchoyan. Along with the noodles were typical Filipino dishes associated with carinderias; linaga (which I heard was also to die for), adobo, arrozcaldo to name a few. But we of course wanted nothing of those. We all wanted a bowl of piping hot batchoy. And Netong’s has six kinds of these to choose from; Special (Php55.00), Super Special (Php70.00), Extra Special (Php80.00), Miswa Batchoy (Php70.00), Bihon Batchoy (Php80.00) and Sotanghon Batchoy (Php80.00). The difference between ordering the first three is simply the size, while the last three are the miki or noodles that are gonna be used in the soup. As one can notice from their menu, there is absolutely nothing regular about Netong’s batchoy, it starts at special; with superlatives added as the prices increase. While Netong’s looked like the typical market carinderia from the outside with its crazy plethora of cooking pans and food trays, it was surprisingly cozy and relaxing once we stepped inside their dining hall. The furniture are made of wood and the whole area, to everyone’s surprise and relief, was air-conditioned. While waiting for our bowls of batchoy, we tried Netong’s serving of putos. Discussions then headed to the ultimate question as to where the first batchoy was served in Iloilo City. Besides Netong’s, whose grandfather claims to have started the batchoy craze in the city, there are actually two more restaurants vying for the title; the more famous Ted’s and Deco’s which are now both found on malls around the country. But the discussion evaporated into wisps of hot steaming air as bowls of Netong’s batchoys started arriving on our table. My mouth started to water as cameras were unholstered and shutter clicks resounded across the carinderia. I’ve never seen a batchoy as rich as the ones served at Netong’s. It was innards heaven with pork livers, kidneys, hearts, spleen, bone marrow and beef loins mixing with the buto-buto caldo broth, garlic, scallions and of course the miki. Crushed chicharon top the heart-stopping soup. And the taste? Oh my batchoy. It tasted as good as it looked. And probably as dangerous too, for people with heart ailments. Once you finish the soup and you still have noodles and innards in your bowl, you can still order an extra serving of broth for no extra fee. Netong’s Original Special Batchoy lives up to the hype of being one of the birth places of the famed Iloilo delicacy. But one thing I like about it more than the other two is its legit marketplace atmosphere. It’s not as commercialized as the other two batchoyans claiming the title. And the batchoy coming out of its kitchen? It looked like it’s still made the same way batchoys are prepared several decades back. 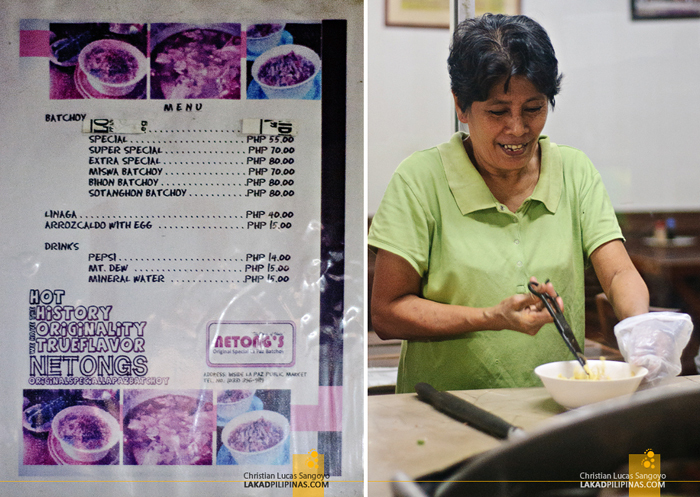 As their placards read, Netong’s batchoys are hot, historical, original and has true flavor. Amen to all that. I was prolly 8 years old when I went to Iloilo and I can't wait to revisit. Am very keen on having a bowl or original La Paz Batchoy! Hope to get the real Bachoy experience... those so called bachoy in the metro just tastes like instant noodles. Nice pictures by the way, nakaka gutom!!! It's the best Batchoy ever :) Absolutely delicious! how to get to La PAz Market form the airport? Thanks! Would you agree that Netong's has the best batchoy in Iloilo?